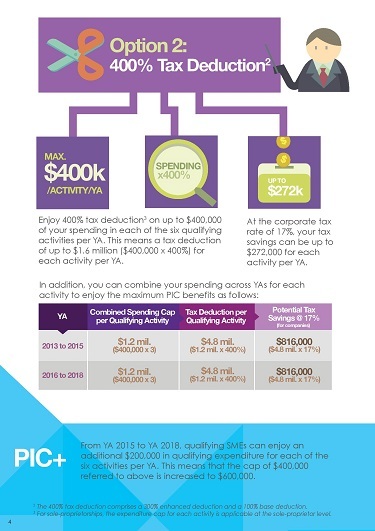 There are two ways you can benefit from your sending in any of the six qualifying activities. 2. 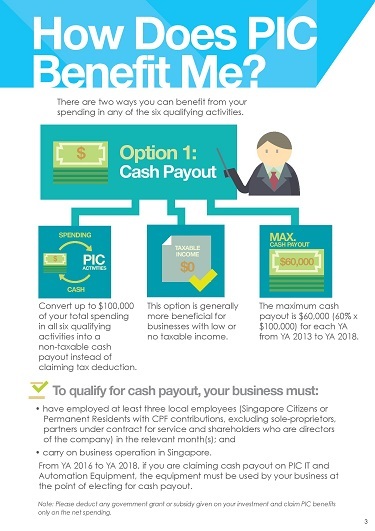 This option is generally more beneficial for business with low or no taxable income. 2. carry on business operation in Singapore. From YA 2016 to YA 2018. If you are claiming cash payout on PIC IT and Automation Equipment, the equipment must be used by your business at the point of electing for cash payout. From YA 2013 to YA 2015, PIC Bonus, which is a dollar-for-dollar matching cash bonus will be provided on top of existing PIC benefits. The PIC bonus is capped at S$15,000 over all three YAs combined. The PIC bonus is taxable. b) have employed at least three local employees (Singapore Citizens or Permanent Residents with CPF contribution in Singapore. 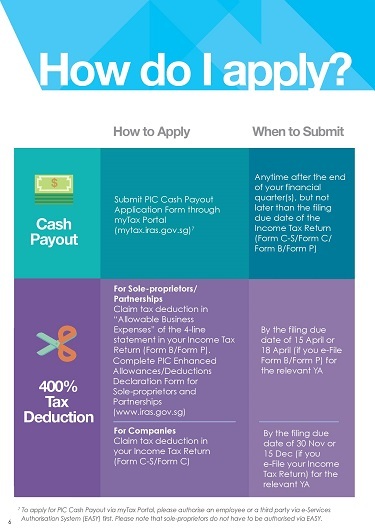 You do not need to apply for the PIC bonus, IRAS will compute the PIC bonus upon approal of your cash payout claim or upon filling of your income Tax Return. For sole-proprietors/partnerships, a PIC Enhanced Allowance/Deductions Declaration Form needs to be fillied with the income Tax Return. 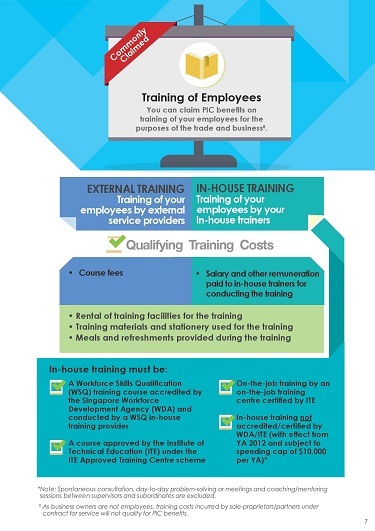 You can claim PIC benefits on training of your employees for the purposes of the trade and business. 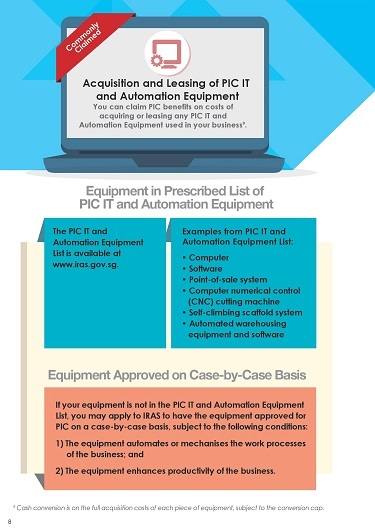 You can claim PIC benefits on costs of acquiring or leasing any PIC IT and Automation Equipment used in your business. b) The equipment enhances productivity of the business. R&D refers to any systematic, investigative and experimental study that involves novelty or technical risk carried out in the field of science or technology, to acquire new knowledge or to use the results of the study for the production or improvement of materials, devices, products, produce, or processes. 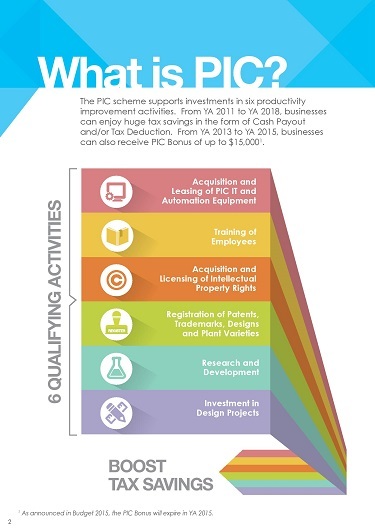 R&D may be conducted by your business or outsourced to an R&D organisation. 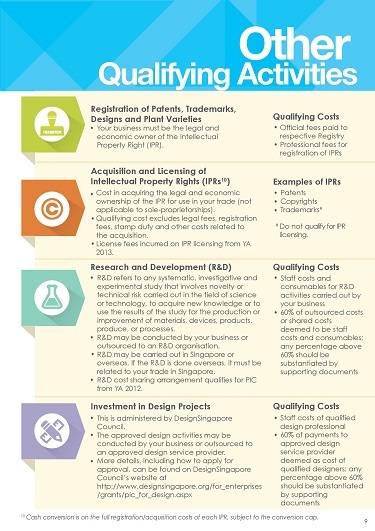 R&D may be carried out in Singapore or overseas. 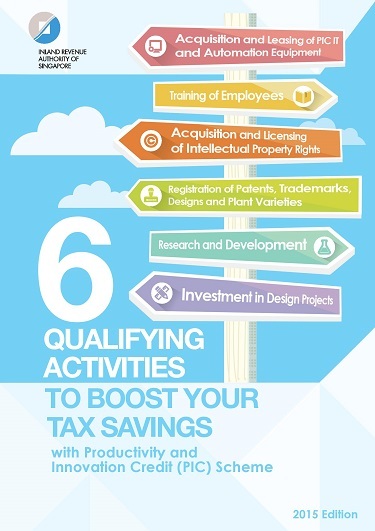 If the R&D is done overseas, it must be related to your trade in Singapore. R&D cost sharing arrangement qualifies for PIC from YA 2012. This is administered by DesignSingapore Council. The approved design activities may be conducted by your business or outsourced to an approved design service provider.